No, it’s my seventh in a row in fact, and I’m just as excited as ever to be in Scotland. I got married! Well, I was already married, but my husband and I had a public ceremony and reception, so we threw a big party and everyone watched us so lovely things to each other. It was very nice, sorry we didn’t see you there! 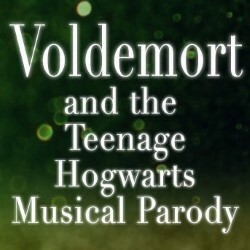 Our show is a loving prequel to Harry Potter following Tom Riddle as a teen before he became He Who Must Not Be Named. It was written by Zach Reino, Fiona Landers, Richie Root, and Scott Passarella, all great friends of mine, and I saw their show a year ago and loved it and thought “I want to bring this to Edinburgh”. It did show in LA before and it sold out, and after Fringe we’ll be doing it again in the US and also licensing the show out if UK companies want to put it on. They should see as much circus and magic as possible, and then see Baby Wants Candy (which I’m also performing in) and then go see a random show that you have no idea about! And then go see Jordan Brookes, who I saw for the first time last year and loved!